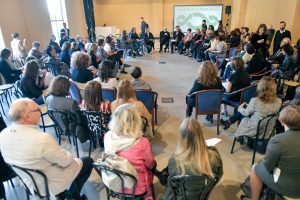 On Sunday 14th October the spaces of Fondazione Pistoletto hosted “Le stanze della moda sostenibile” (The rooms of sustainable fashion), attended by over 300 artists, brands and fashion designers. During the event and a round table discussion, the guests shared the specificities of their eco-sustainable projects. 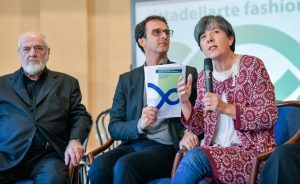 A prestigious jigsaw puzzle composed of fashion designers, artists and political-institutional figures gathered in Cittadellarte for “Le stanze della moda sostenibile” (The rooms of sustainable fashion). 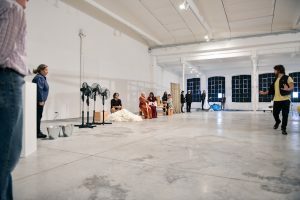 As announced in a previous article, this is what happened on Saturday 14th October in the spaces of Fondazione Pistoletto on the occasion of the exhibition event whose fil rouge was the binomial fashion and sustainability. 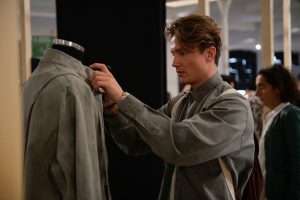 An innovative intertwining among some of the most important national and international fashion brands and designers, who shared stories and low environmental impact projects describing their specificities. 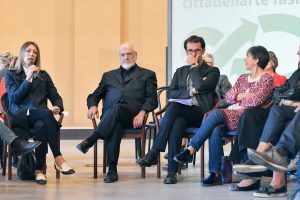 Cittadellarte was the backdrop for a meeting of minds, together to make the world aware of the need for a radical change involving the textile industry and the consumers in the name of “Social Impact Fashion”. 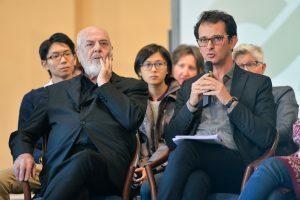 The initiative was realized thanks to the collaboration between Fondazione Pistoletto and IAAD, in connection with SID, the new degree course active from September 2018. 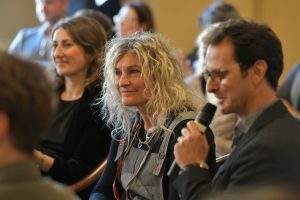 The event took place in the context of the first “Turin Fashion Design Week”, itself part of the “Torino Creative City for Design UNESCO”, during the first general assembly of the “World Design Organization”. 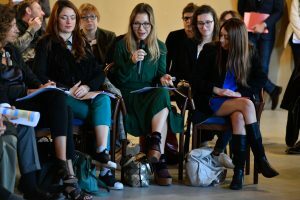 In regards to this, Saturday’s event at Cittadellarte followed the “Fashion Show Prominent Designers” of the day before, held at the Ex Borsa Valori in Turin and organized by IAAD, where international prominent designers showcased the theme “RE-EVOLUTION”. The occasion highlighted projects with a strong aesthetic and conceptual connotation, focused on new possible interpretations of the relationship among design, fashion and art. 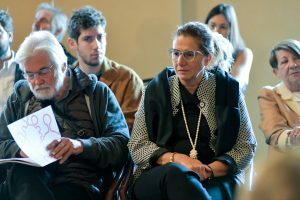 Laura Milani, director of IAAD, spoke along the same lines: “This event was an occasion to reflect on the theme of fashion combined with an important issue like sustainability. Dispelling common beliefs and bringing together topics traditionally distant from one another is one of the objectives of the role of the designer we have showcased as film directors and on which we work hard as a university”. 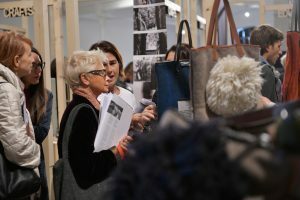 The day, as said, was centred around the theme of sustainable fashion. What is that about? “We started wondering it in 2009,” explained Naldini, “when Cittadellarte launched B.E.S.T. – Bio Ethical Sustainable Trend, a platform of companies, producers, communicators, political, educational and formative institutions. It is a very diversified group who has allowed us to meet hundreds of protagonists who have told us, like characters in a book, the stories unweaving in the rooms of the house of sustainable fashion. 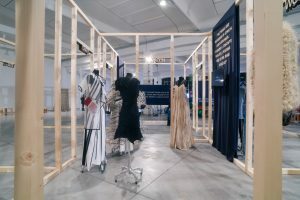 It is a big house with a lot of rooms and characters – the director refers to the exhibition “Le stanze della moda sostenibile” (The rooms of sustainable fashion), editor’s note -; we have met some and invited them to the Foundation to tell their stories”. (The theme of “sustainable fashion” was analysed in depth by Naldini in a previous article). 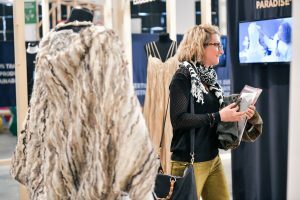 After the initial greetings, the exhibition “Le stanze della moda sostenibile” – running till the end of October – opened in the rooms of the Museum of the Present. This space now hosts “Porte-Uffizi” (from the homonymous work currently set up on Cittadellarte’s top floor), which is a spatial representation of Cittadellarte’s philosophy and its commitment to taking art into all sectors of society. Specifically, it is composed of wooden frames forming the perimeters of rooms and doors, each displaying a key word at the top. 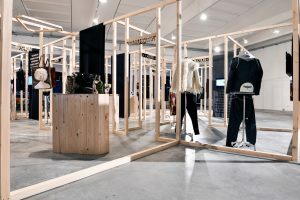 This structure physically connects the social areas mentioned on the doors: economy, politics, production, ecology, work, communication, education, fashion, law, crafts, health. These words provide the link with the projects of a few of the participants invited, with the work used as a scenic design for the set up. How? Eco-sustainable case studies are displayed within each door, each room has two “guests”: eleven institutions showcasing a project they deem important. Here’s an example: UNECE United Nations Economic Commission for Europe has presented Giada Daolio with the project “Macroteria” and “Orange Fiber”. 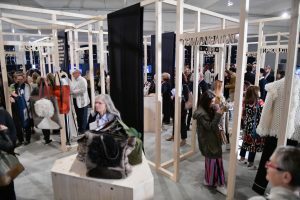 Fashion designers and artists have been provided with a shared space to illustrate the specificities of their projects and exhibit their clothes. A network intertwined with the fil rouge of sustainability. “The exhibition”, explained Juan Sandoval, responsible for Cittadellarte’s Art Office, “was conceived on the basis of a collective idea. 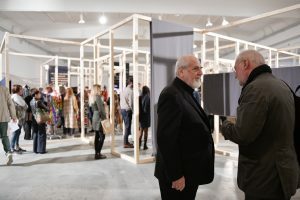 Michelangelo Pistoletto’s work “Porte-Uffizi” is at the centre of it, we then used the key words in reference to the various disciplines presented, like sectors of society. Eleven are the spaces occupied by as many projects/brands, the twelfth element being art. At the exit from the rooms of the work, in fact, you find the word “art”, as if the whole structure laid on this macro-sector. In this “container” we have conveyed fashion sustainability through three elements: the clothes, the tweets and the videos”. These are not the only ingredients which made the exhibition event successful. There is an area providing informational material like magazines and presentations. 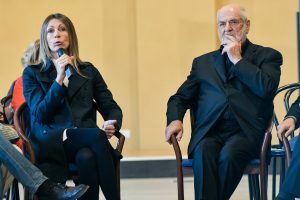 The room also displays Pistoletto’s work “Prima scena – La presentazione”, a big scale mirror painting representing the artist himself, Franca Sozzani and the designers who took part in the opening event of the B.E.S.T. project. All this recalls the origin of Cittadellarte’s fashion project. Another important element of the event was the work by Nico Angiuli, with which he told us about wool using his performative language. 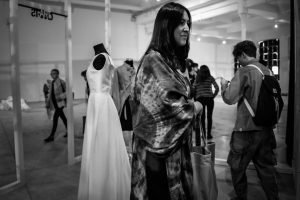 “We can’t analyse the world of fashion without focusing on the production of textiles, from which sustainability must start,” added Sandoval. 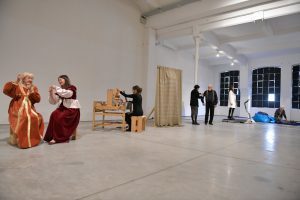 Nico Angiuli’s performance “Del vello di pecora e altri ruminanti” (About the fleece of sheep and other ruminants, mentioned in a previous article), which involved Michelangelo Pistoletto himself in the role of “actor”, deconstructed the process of wool production showing the different geographical and historical worlds linked to the animal fibre in a sort of lyrical-poverist supply chain. 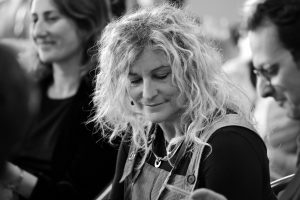 “With this performance,” explained Angiuli, “we meant to highlight not only the processes of production and transformation of wool from animal’s to people’s skin, but also tensions and contemporary memories wool contains in itself”. After the performance, it was time to dialogue and share at a round table discussion. 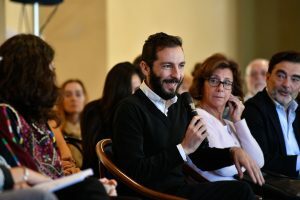 This debate, moderated by Cittadellarte’s director Paolo Naldini, was the focal point of the whole day: the guests talked about sustainable fashion presenting their projects. Who took part in the event (besides the already mentioned “Macroteria” by Giada Daolio)? MoMu Fashion Museum Antwerp with “Maison Martin Margiela” and “HonestBy”; Bocconi – Milano Fashion Institute with “Patagonia”; Textile and Health with “Stories of Fashion” (Biella’s Industrial Union and Chamber of Work); Vogue Talents presenting Manuel Hallermeier and Yekaterina Ivankova; Socially Made in Italy with Carmina Campus by Ilaria Venturini Fendi; Fashion Revolution with “Cangiari“; Cittadellarte Fashion B.E.S.T. presenting Sandra Backlund, Tiziano Guardini and Nadia Shaulova & Giulia Romano (both with the project Social Fashion); SMI Sistema Moda Italia with “HERNO – Eurojersey”; ETI – Ethical Fashion Initiative with “Lai momo Istitution”; Prato’s Museum of Textile with “Detox” (articles about the various guests will follow).